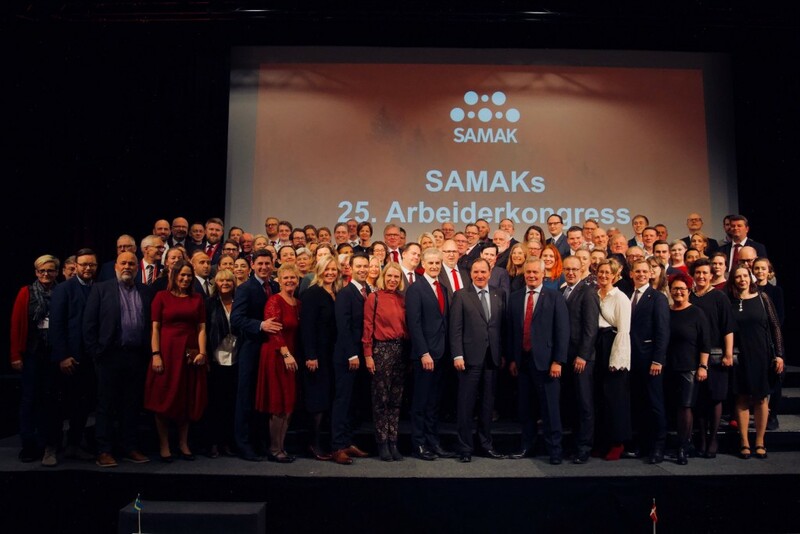 Political statement adopted at SAMAKs 25th Workers’ Congress Februar 6th 2018 at Arlanda, Sweden. Unofficial translation. Once again we turn to a new chapter. We have the capacity and will to take the Nordics even further. The Nordic Model is, with its equalisation, effectiveness, gender equality and trust, unique in the world. A well organised world of work is a basic pillar of the Nordic Model. Without the equalisation of wages, on the job training and the employees’ codetermination we would have had a different Nordics. Our task number one is to create more good jobs and a safe daily life for everyone. We choose cooperation rather than going alone, higher competencies rather than lower wages, welfare rather than less tax to the common good. Never before have the Nordic countries had larger possibilities. We have the competence, the technologies and the cooperation which can lift the Nordics further. This gives rise to optimism. However, at the same time the challenges are increasing, not least in the world of work. We see tendencies towards a more dual labour market, more uncertain jobs and social dumping. A historic lifting of competencies in the labour market. The firms must meet changes by strengthening their employees’ competencies, not by replacing them. Only this way can we meet new technology without drifting into a world of work dominated by uncertain short time work. Such an effort must be made in partnership by the organisations in the labour market and the governments, and be a part of the development towards a green economy. Action plans against social dumping and labour market crime in all the Nordic countries. We cannot accept that social dumping spreads throughout the Nordics. The employees will lose from this, but also the good, long term employers. The fight against social dumping demands many different instruments and a systematic effort. Municipalities, regions and national authorities should adopt requirements for decent work in public procurement and tenders. A powerful special effort for our organised world of work. In parts of the world of work the percentage of employees being organised is falling. Firms and employees alike must be organised. If not, not only the world of work, but the whole Nordic Model loses out. That is why this effort is a societal task, and hence also a governmental responsibility. In the SAMAK project «The Future World of Work» we have gotten a broad menu of instruments to see these three actions through. In this way the Nordic Model shall develope, not disintegrate.